This is often seen in older sows on their flanks and may be associated with Ovarian Cysts. Hair can sometimes become a bit thin, or there may be complete hair loss from the area around the Ovaries. Sows can have Ovarian Cysts without showing any symptoms, others develop large cysts which can cause discomfort in the abdominal area. Diagnosis is required from your Vet and treatment using hormone injections (Chorulon) is often very successful. Fluid filled cysts can also be successfully drained by a guinea-competent Vet without an anaesthetic. These options are far less invasive than an Ovio-Hysterectomy which should always be a last resort as it is a very serious operation for a sow. Sows may experience thinning of the hair or hair loss associated with pregnancy and lactation as hormones can affect the function and growth of hair. This can happen in the later stages of pregnancy and shortly after parturition and can cause symmetric alopecia on the flanks. As long as there is no other underlying problem such as lice or mites, the hair will usually grow back in time without requiring any treatment. 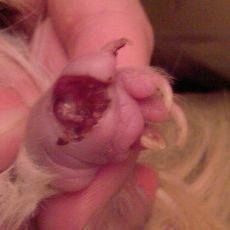 Bumblefoot (also know as Pododermatitis) is a swelling / ulceration of the foot pad that can be very painful for a guinea. The condition is often bacterial in origin but can also be fungal, and can prove difficult to treat. Vets often prescribe antibiotics such as Baytril, together with Rimadyl which helps with inflammation / pain relief. It can also be helpful to soak the affected foot in a dilute solution of Iodine each day. These work with varying degrees of success – it seems that there is no one easy answer to this problem and several options need to be tried. 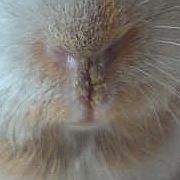 Guinea pigs can present with crusty sores around their mouth / lip area and up towards the nose. This type of problem can be bacterial or fungal in origin, so treatment with antibiotics either orally and / or in a cream or gel form may not work. Our F&M Ointment has been designed to help guineas with crusty noses / lips mouths and can be applied 2 or 3 times a day to help soften the scabs. Please note: you DO NOT need to remove the scabs before applying the F&M Ointment. This is recommended on some web sites, but is painful for the guinea and not nice for the human. The F&M Ointment will soften the scabs and they will come off in their own time. Sometimes the sores can be caused by the guinea eating acid fruit such as apple or tomato, so it is always worth removing them from the diet to eliminate a possible cause. Hair can be chewed off either by the guinea pig itself, or by a cage mate and may be caused by boredom, stress, a behavioural problem, hierachy issues in the group, or lack of hay. Where cage mates chew the hair, it can be from any part of the body. When the guinea is self-barbering, hair will only be missing from places that he can reach, so the culprit should be easy to identify. Ensure that the guineas concerned are given unlimited access to plenty of fresh, green meadow hay to keep them occupied – this will often stop the problem. Behind the ears – an area of 1cm to 1.5cms. On the inside of their front legs on the “ankle” area.